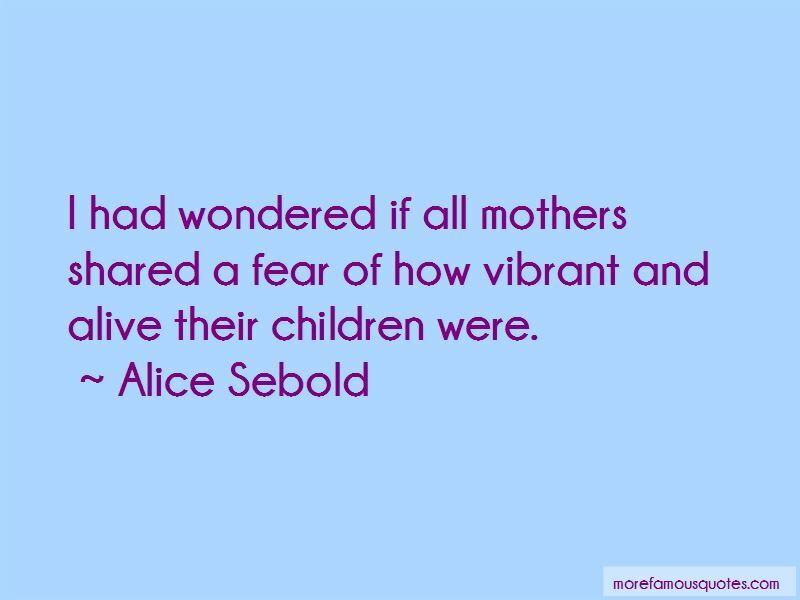 Enjoy the top 241 famous quotes, sayings and quotations by Alice Sebold. “You look invincible,' my mother said one night. Your first kiss is destiny knocking. “Sometimes Holly seemed like she wasn't paying attention, and other times she was gone when I went looking for her. That was when she went to a part of heaven we didn't share. I missed her then, but it was and odd sort of missing because by then I knew the meaning of forever. But, he also said it because part of him wanted more of her, this cold woman who was not exactly cold, this rock who was not stone. She told her journal about me passing by her in the parking lot, about how on that night I had touched her-literally, she felt it, reached out. What I had looked like then. 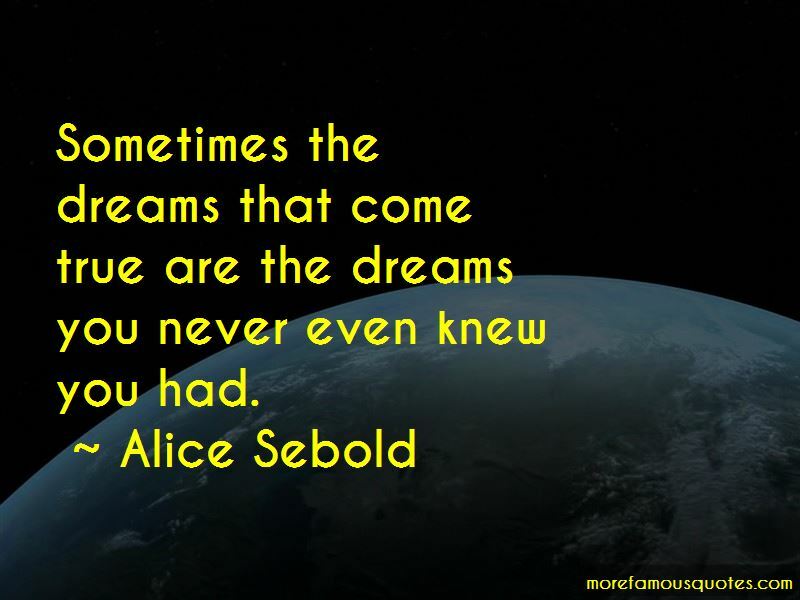 How she dreamed about me. How she had fashioned the idea that a spirit could be a sort of second skin for someone, a protective layer somehow. How maybe if she was assiduous she could free us both. I would read over her shoulder as she wrote down her thoughts and wonder if anyone might believe her one day. "You're a really good poet Ruth," she imagined me saying, and her journal would release her into a daydream of being such a good poet that her words had the power to resurrect me. I focused very hard on the dead geranium in his line of vision. I thought if I could make it bloom he would have his answer. In my heaven it bloomed. In my heaven geranium petals swirled in eddies up to my waist. On Earth nothing happened ... I stood alone in a sea of bright petals. “Outside the hospital, a young girl who was selling small bouquets of daffodils, their green stems tied with lavender ribbons. I watched as my mother bought out the girl's whole stock. Nurse Eliot, who remembered my mother from eight years ago volunteered to help her when she saw her comng down the hall, her arms full of flowers. She rounded up extra water pitchers from a supply closet and together, she and my mother filled them with water and placed the flowers around my father's room while he slept. Nurse Eliot thought that if loss could be used as a measure of beauty in a woman, my mother had grown even more beautiful. I was not in the bathroom, in the tub, or in the spigot; I did not hold court in the mirror above her head or stand in miniature at the tip of every bristle on Lindsey's or Buckley's toothbrush. In some way I could not account for- had they reached a state of bliss? were my parents back together forever? had Buckley begun to tell someone his troubles? would my father's heart truly heal?- I was done yearning for them, needing them to yearn for me. Though I still would. Though they still would. Always. I can't describe what I'm feeling," she said. "To anyone. Susie?" "Yes?" "Just have fun, kid. To transform experience and thought into language and narrative - that is beautiful even if that beauty is in brokenness. I missed her then but it was an odd sort of missing because by then, I knew the meaning of forever. She was unaware that she was somewhat of a celebrity up in heaven. I had told people about her, what she did, how she observed moments of silence up and down the city and wrote small individual prayers in her journal, and the story had travelled so quickly that women lined up to know she had found where they'd been killed. She had fans in heaven ... Meanwhile, for us, she was doing important work, work that most people on Earth were too frightened even too contemplate. 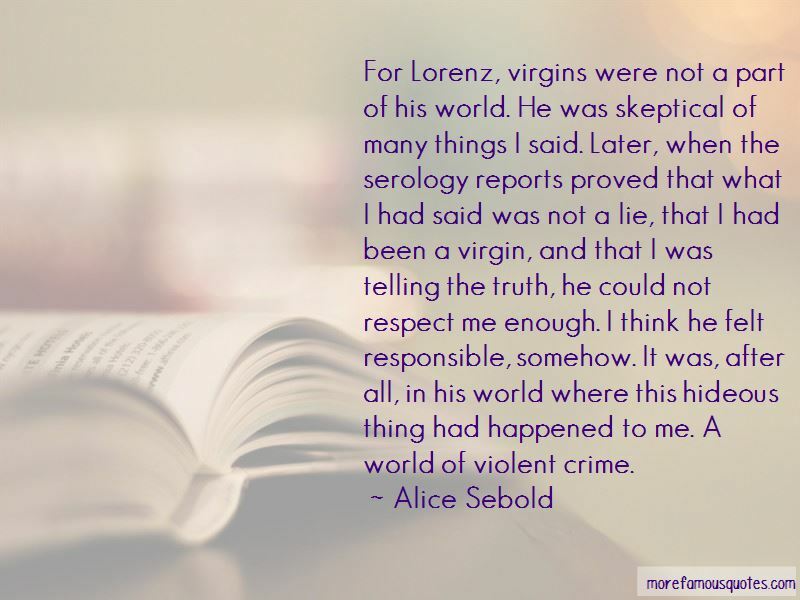 Want to see more pictures of Alice Sebold quotes? 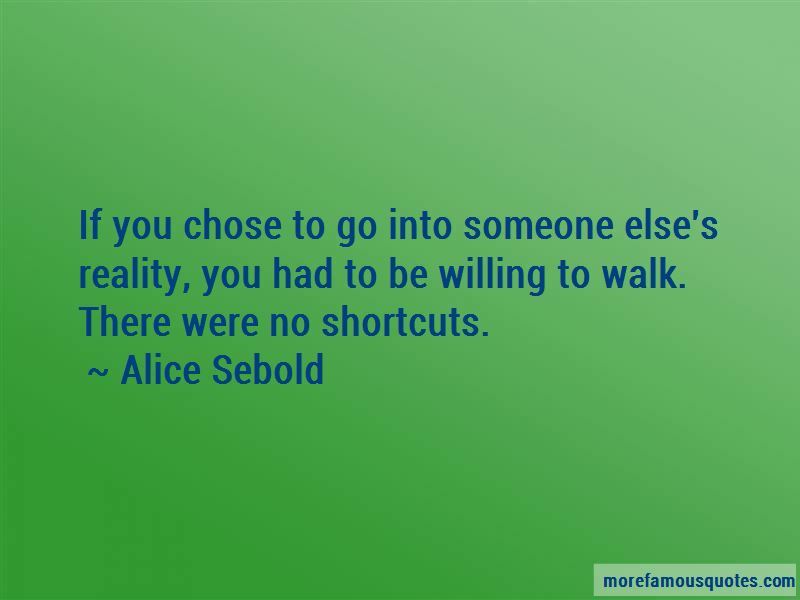 Click on image of Alice Sebold quotes to view full size.